"This morning I had a The Path to Heal session with Joanna. My goal for the session was for my dogs to behave better when I take them for a run. They were getting too excited when I put their leashes on. On leash, one of my dogs is always pulling the leash making my runs unpleasant. I have the awareness that my dogs pick up on my energy so I thought that The Path would be a great place to work it out. After a great session I went for a run with the dogs. They sat quietly when I put the leashes on, and they ran side by side with me and each other, no pulling! The shift was amazing. Thanks Joanna!" Many of us do not make the connection, that our dogs may be a reflection of us to some degree. Th ey may be reacting to our energy in some way and acting out or misbehaving. Rebecca Cohen, the founder of The Path To Heal has 2 dogs. And while the dogs may be calm with another member of her household, sometimes they reacted to her and her fears. Once we cleared the fear with a path session, the dogs behavior also changed. This recognition of human fears triggering strange dog behavior inspired a new book, What is My Dog Teaching Me About Me? (available on amazon.com). 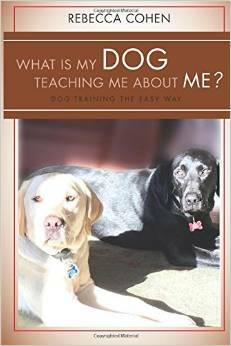 She "discovered that by observing the behaviors in our dogs that trigger us, we can discover what we fear in ourselves. More specifically, our dogs are teaching us to be leaders and their behaviors reflect where we are afraid to assert ourselves. As we are mirrors of each other, ....it is much easier to make this discovery with dogs. Dogs are happy to change as quickly as we get our insights. It’s not about them; it’s about us. Our dogs trigger us when they display behaviors that make us feel unsafe. behavior will no longer trigger us." In this case, we released the client's issue and her dogs behaved as my client had intended. You can choose do your own reflection, or you can choose to schedule a Path To Heal session to identify and release the underlying fear, trigger or unsafe feelings. The book will also help with knowing what to reflect on (it is pretty cool! When we were at the Mind< Body Spirit expo a few weeks ago, people read the specific conditions that dogs were displaying. Then followed the sequence as to what the trigger may mean, what reflection to contemplate and offer an affirmation to clear the reader's issue. Each one would say "OMG, that is exactly the issue!) So you can heal me, then heal my dog? It was quite a revelation. "By becoming conscious of what the dog’s behavior is triggering in us, we can let go of the trigger." either thru the book or with a Path To Heal session. The sessions are usually 30-45 minutes in length and can lead to profound insight and learning. It will help release the underlying issue to help not only the client, but the seemingly annoying behavior their dog may be exhibiting. Joanna K Chodorowska is an advanced Path To Heal practitioner helping clients elevate their consciousness to that of unconditional love. As we become more loving of ourselves and our situations, we become more loving to others and more peaceful in our existence. Path To Heal sessions are fun as well as healing on a subconscious and soul level. Create the life you want so your Ego can resonate with your heart, body and soul. Sessions can be done via phone, in person, by Skype or in groups. Please check the website for package offerings. Or call Joanna at 215-272-6774 to schedule your session.